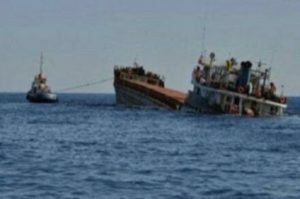 The general cargo ship Rigel A sank off Al Mukalla in southeastern Yemen. The vessel was at the anchorage off the port and waiting to dock at the terminal for unloading, when the hull cracked and started getting water ingress. The crew started pumping out the water, but ship had two-meter-long breach in the engine compartment and quantity of water was too high. The general cargo vessel increase trim to aft and started sinking. The crew sent distress signal to the local authorities and abandoned the vessel into a life raft. The vessel was partially sank, when all the two Syrian and six Indian crew were rescued by the coast guard near the accident scene. A few hours later the general cargo ship Rigel A sank, fully disappeared touching the bottom. All the crew were in good health and transported to the local hospital for medical examinations. The local authorities started investigation for the root cause of the accident. The large hull breach in the engine compartment flooded the vessel, which sank under reduced seaworthiness. According to the investigation, the ship sank for less than 3 hours. There is no report about water pollution, but authorities are monitoring the area of sinking. The general cargo ship Rigel A has no international registration. The vessel presumed to be local coastal freighter, which operated mostly in Gulf of Aden and Arabian Sea. According to the local media, the ship was carrying 1,700 tons cargo of food and appliances for local businesses. The vessel has overall length of 90.00 m, moulded beam of 12.00 m and maximum draft of 2.50 m. The deadweight of the cargo ship Rigel A is 1,652 DWT and the gross tonnage is 1,875 GRT.